An Indiscriminate And Reckless Attack: Curiously, the British Prime Minister, Teresa May, does not appear to regard the “indiscriminate and reckless” attacks made against “innocent civilians” living on the soil of other United Nations member-states as being worthy of the unequivocal condemnation contained in her statement to the House of Commons on 12 March 2018. Only when the alleged attacker is the Russian Federation does the UK start screaming blue, bloody murder. “I AM STRONGLY in favour of using poisoned gas against uncivilised tribes.” So said Great Britain’s Secretary of War, Winston Churchill, in 1920 – and he was as good as his word. That same year, Aylmer Haldane, the commander of British forces in Iraq bombarded the villages of rebellious “uncivilised tribes” with gas-filled shells. The British estimated Arab casualties at 8,450 killed and wounded. The action was deemed a resounding success. The use of chemical weapons had engendered, in Churchill’s telling phrase, “a lively terror”. Much of Southern Iraq remains contaminated with the residue of the depleted uranium shells used by American armoured columns against the Russian-made tanks of the Iraqi army in the Gulf War of 1991. During the first and second battles for the Iraqi city of Fallujah, in 2004, the use of white phosphorus explosives (first developed for anti-personnel purposes in World War I) inflicted hideous burns on hundreds of the city’s inhabitants – civilian as well as insurgent. The United States and British-led invasion of Iraq in 2003, undertaken in defiance of the United Nation’s Charter and without the authorisation of the UN Security Council was, in the near-unanimous opinion of jurists around the world, an egregious breach of international law. To date, no nation state, or collection of nation states, has imposed diplomatic or economic sanctions on the United States or the United Kingdom. The individuals responsible for planning and executing the illegal invasion of Iraq are free to travel and conduct business wherever they choose. The suspected use of an illegal chemical weapon by the Russian Federation has provoked near-universal condemnation. Rightly so, because the deployment of a deadly nerve agent in the picturesque medieval city of Salisbury was an extraordinarily reckless act. The sheer lethality of the substance has inflicted critical injury not only upon the target of the assassination attempt, the Russian double-agent, Sergei Skripal, but also upon his 33-year-old daughter, Yulia, and the local police officer who rushed to their aid. Anyone or anything coming into contact with the Skripals is now being treated as a potential bio-hazard. Curiously, Prime Minister May does not appear to regard the “indiscriminate and reckless” attacks made against “innocent civilians” living on the soil of other United Nations member-states as being worthy of an equally forthright parliamentary statement. Since 2001, armed Predator drones piloted by United States armed forces personnel have patrolled the skies above Africa and the Middle East. Their mission: to track the precise location of individuals and groups whose very existence has been deemed inimical, by the CIA and other intelligence gatherers, to the national security of the United States. When the location of these “targets” had been pinpointed, the US launched one, or both, of the Hellfire missiles carried under the Predator’s wings. Sometimes these missiles achieved a “clean kill” – “neutralising” only their targets. 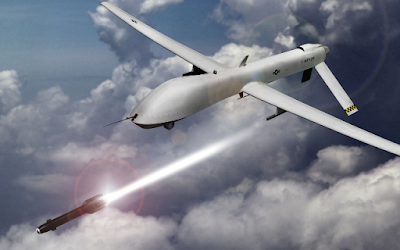 On other occasions, however, these US drone strikes inflicted “collateral damage” – killing or maiming the “innocent civilians” living inside the blast zone. It is passing strange, is it not, that the global news media has, to date, seen no need to whip itself into a lather of fury over the fate of these casualties of state-sponsored terrorism? Especially when the death-toll from this US policy, which operates well outside of any reasonable reading of international law – or justice – now numbers in the thousands. Then again, we are only dealing here with members of those “uncivilised tribes”: human-beings for whom the protection of the law was deemed, as long ago as 1920, and by no lesser authority that Winston Churchill, to be unwarranted. When set against these current and historical facts, the propensity of Vladimir Putin to engage in “indiscriminate and reckless” acts is suddenly rendered grimly intelligible. If the West’s use of poison gas, depleted uranium, white phosphorus and Hellfire missiles elicits no outrage in the House of Commons; and if the “international community” is not moved to impose diplomatic and/or economic sanctions against those responsible; then perhaps the only reasonable lesson to be drawn is that “international outrage” has now become just one more “lively terror” to be unleashed upon the “uncivilised tribes” of Planet Earth. This essay was originally published in The Press of Tuesday, 20 March 2018. What to make of the Salisbury Distict HospitalED consultant's letter in the London times on the 12thMarch? onl 3 people have been affected by "significant poisoning"
Moral hypocrisy is I suspect a deep seated survival technique...its only alternatives are possibly amorality or self destruction. History repeats itself in varying doses of hellfire and death. Indeed Chris. One commonality in all of the events mentioned; the media painted the victims as baddies, their own side was depicted as moral and nice guys. Weapons of mass destruction...hmmm another lie that the media fostered. Yet these same charlatans and arse lickers point the finger at Russian "criminality". They lack credibility based upon their track record. I for one am not convinced when May, Boris and their associated presstitutes talk about circumstantial evidence without stating that evidence. I hear lies. When I made this comparison on the D B, I was accused of "Whataboutism". This is a wonderful new word that allows the user to completely demolish any argument that seeks to put world events into perspective without any need for research, thought, or reasoning. It's amazing that the world has got by without it for so long. Today I here that Mrs May is not going to take any further steps to punish Putin's Russia, no more sanctions, no more evictions. Perhaps she has noticed that the enquiring section of the public is not buying the story that "The Russians did it" . And that wilful (second run)child in the White Day care centre . rang Mr Putin and not only congratulated him when it expressly said on his instructions "DON"T CONGRATULATE" in capital letters, but failed entirely to accuse Mr Putin of this dastardly deed of poisoning when it was clearly stated on the written instructions that he was to do so. For god's sake! You would almost think he imagined himself to be the president of the United States or something. And then he actually went on, without a wisp of authority, to arrange a meeting to talk about things like arms escalation and the Ukraine , and Syria for god's sake. How the hell can the chaps get their 20 tons of chlorine landed in al- Tanf to set off in Ghouta and flag a jolly bombardment of Assad's lair in Damascus off the ground when he's queering everything up by visiting Moscow and chatting with Putin just when the show is about to get on the road. What a brat! I have an inlaw (outlaw actually) with whom I often debate things, always in good humour. On one occasion in company, we were thus engaged ,( I don't remember the topic). when he desisted so suddenly that someone was moved to ask "Why did you give up" .To which he disarmingly replied " The facts were against me; and furthermore they can be readily verified". Wouldn't it be wonderful if Mrs May could turn out to be so frank. "I was accused of "Whataboutism". This is a wonderful new word that allows the user to completely demolish any argument that seeks to put world events into perspective without any need for research, thought, or reasoning. " It's also a way of trying to demolish someone's argument or discredit their ideas, but not by addressing the actual question. So you should be careful in the way you use it. Oh dear! Did that piont not come through? I'll have to make myself clearer. As Chris remarked, a considerable number of states assassinate their political opponents and renegade citizens living within foreign jurisdictions. The United States, Australia, Israel and the United Kingdom do, and if New Zealand was not also complicit in extra-judicial extra-territorial killings it would have no need for the services of Citizen Thiel. But until there is a generally accepted international convention banning state assassinations, and a judicial process for bringing charges against non-compliant states, any cases will be argued in a political context where evidence may be either insufficient or deemed unnecessary and where the case will be coloured by the political interests and biases of opposing states. Given that, all we can reasonably do in the current situation is declare against assassination in principle. Having done that, I suggest that we can continue to maintain more or less normal relations with states, including the Realm of New Zealand, which regard assassination as a legitimate political instrument, though I recognise that point may be moot. Turns out whataboutism is not that new either. I discover it was coined in the 1960s. It was a technique used by the USSR propaganda machine to dismiss Western criticisms as I said above – without actually addressing them. While I agree that May is a hypocrite (e.g. as the UK provides weapons to Saudi Arabia which is doing horrible things in Yemen and because the UK tolerates rich Russians laundering dodgy money through the purchase of London property), that does not make the act of using a nerve agent any less or more shocking in terms of its impact and more importantly in terms of it implications. E.g. Imagine what could happen if a larger amount of nerve agent is smuggled into the UK and there is an accident with it? Maybe I am influenced by my grandfather's experience on the Western Front in WW1 to view chemical weapons with particular horror. You might be interested to know that Porton Down has "form" in this Yes it is an outrage that nerve gas was used on the streets of Salisbury. The use of poison gas in Iraq in the 1920s was considered by the British but it seems less clear whether the British actually used gas. (https://en.wikipedia.org/wiki/Alleged_British_use_of_chemical_weapons_in_Mesopotamia_in_1920). "I am strongly in favour of using poisoned gas against uncivilised tribes. The moral effect should be so good that the loss of life should be reduced to a minimum. It is not necessary to use only the most deadly gasses: gasses can be used which cause great inconvenience and would spread a lively terror and yet would leave no serious permanent effects on most of those affected." Not that I want to be an apologist for Winston Churchill but it is still worth noting. Of course Churchill could well have written 2 similar statements on different occasions.